Many people are eager to find the video converter to handle and convert one type of video to another so that you can play them on various devices or players. However, you will have trouble locating the right one since so many options of video converter softwares are available on the market. What is the best video converter on Windows (Windows 10 included)? How to choose the right and best video converter? What are the good qualities that the best video converters shall process? Here you're introduced with some video converter apps. You can choose from the top 5 video converter software on Windows 10 to finish your task. Such situations may occur if you made a video in one different format but want it to be in a different format so that you can play them on various devices. Another reason might be that you do not have a specific video player and the format in which your video is, it is not supported by the video player. So it's very essential in today's digital era to have the convenience of easily converting videos from one format to another, the problem then arises as to what the solution exactly is. EaseFab Video Converter is the answer to all your video related problems. So what exactly is EaseFab Video Convertor you ask? Well, it is nothing but an amazing collection of features and tools that let you convert videos as easily as you can imagine. However, EaseFab Video Convertor is much more than just a simple convertor. Let us see what other amazing features does this piece of program has to offer. So first and foremost, the primary feature of this program is that it converts videos. However, the magic lies in the way it does that. With EaseFab Video Convertor, you can convert videos into almost any format you can think of such as WMV, MP4, MOV, MKV, AVI and much more. You can convert HD videos as well. This software converts files of various formats in a 6X faster conversion speed. It helps you save much of your time spent in format conversion. 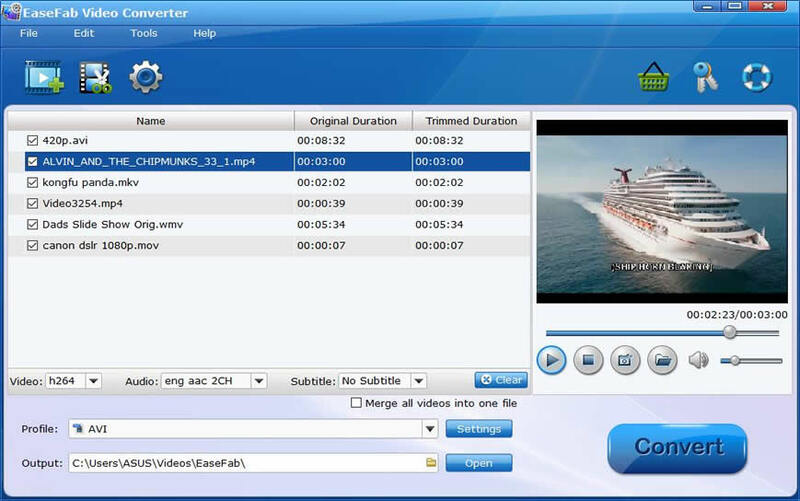 EaseFab Video Converter allows various kinds of users to use the program easily. No special skills are required. Whether you are a beginner or an experienced user, you will find it easy enough. If you need to edit your videos before converting them to other formats, you can do that with EaseFab Video Converter. You can also trim. crop, add watermarks, add effect to your videos freely. Free Studio 5.3.3 is another suitable software to convert videos. It comes with 45 freeware tools that can help you with a number of tasks related to video conversion and editing. 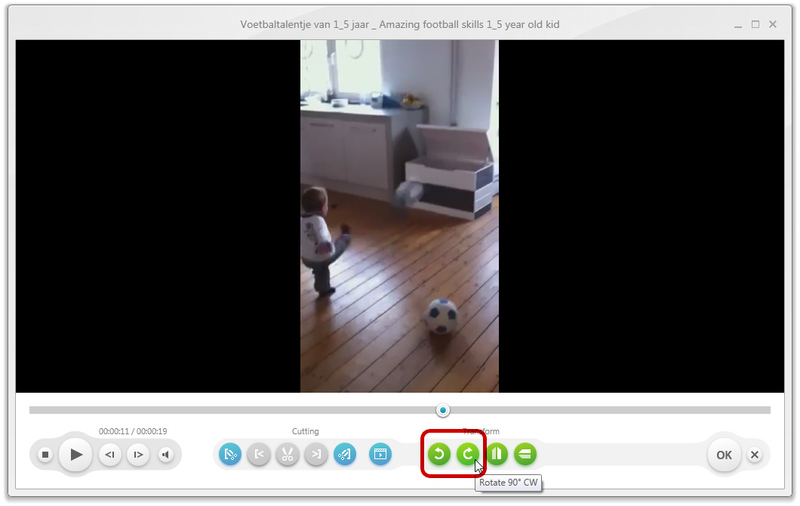 It is again easy to use since all you have to do is drag a video clip in, choose an output format and click convert. Any Video Convertor 3.3.2 is perhaps the best free solution for converting videos if you do not need any advance features installed. All you have to do is drag a video into the program and select the format in which you want to convert and then click "Convert Now"! 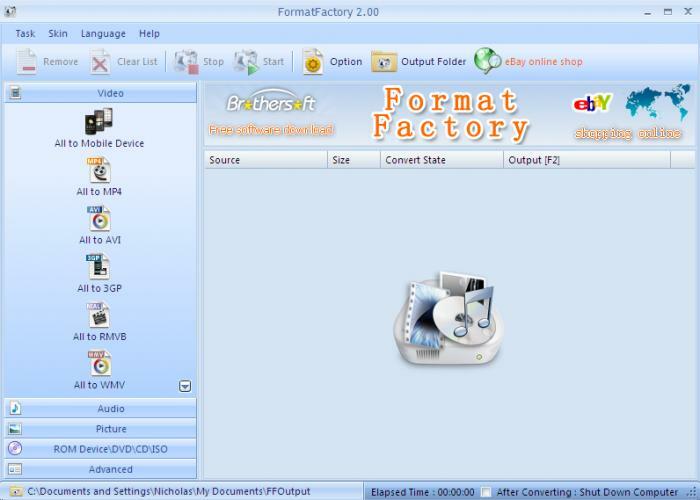 Format Factory 2.8 is a very basic video converting tool. You simply choose the file you want to create, add in the videos and select the output format and hit convert.